CoalitionWILD was represented at the World Leaders’ Conservation Forum in early October, sharing to the delegation our vision for empowering the next generation. To us, empowerment means giving emerging leaders the tools they need and the conviction that they know how to use those tools best. We shared our success stories – like of Ecuador’s Liliana Jaramillo who had a vision for a greener Quito, but wasn’t sure where to start. In only a year’s time as a Young Champion of the Earth, and with the support of CoalitionWILD, Liliana incorporated her company, Nativus, and has installed two green roofs in Quito utilizing native plants and interpretive signage. Progress is not only possible – it’s happening, and it’s driven by ambitious and passionate young leaders who have a vision for a better future for all life. 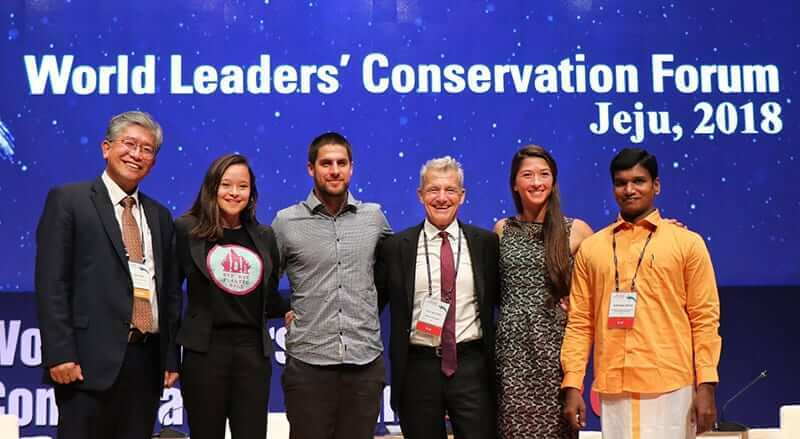 It was a pleasure sharing the stage with host, National Geographic Explorer Paul Rose, Bye Bye Plastic Bags and Melati Wijsen, Conservamos por Naturaleza and Bruno Monteferri, and the OMCAR Foundation and Vedharajan Balaji – young global leaders leading the way.